Introduction Children entering out-of-home care have high rates of health needs across all domains of health. To identify these needs early and optimise long-term outcomes, routine health assessment on entry to care is recommended by child health experts and included in policy in many jurisdictions. If effective, this ought to lead to high rates of health service use as needs are addressed. Victoria (Australia) has no state-wide approach to deliver routine health assessments and no data to describe the timing and use of health service visits for children in out-of-home care. This retrospective cohort data linkage study aims to describe the extent and timeliness of health service use by Victorian children (aged 0–12 years) who entered out-of-home care for the first time between 1 April 2010 and 31 December 2015, in the first 12 months of care. Methods and analysis The sample will be identified in the Victorian Child Protection database. Child and placement variables will be extracted. Linked health databases will provide additional data: six state databases that collate data about hospital admissions, emergency department presentations and attendances at dental, mental and community health services and public hospital outpatients. The federal Medicare Benefits Schedule claims dataset will provide information on visits to general practitioners, specialist physicians (including paediatricians), optometrists, audiologists and dentists. The number, type and timing of visits to different health services will be determined and benchmarked to national standards. Multivariable logistic regression will examine the effects of child and system variables on the odds of timely health visits, and proportional-hazards regression will explore the effects on time to first health visits. Ethics and dissemination Ethical and data custodian approval has been obtained for this study. Dissemination will include presentation of findings to policy and service stakeholders in addition to scientific papers. Children and young people entering out-of-home care (looked after children) have high rates of health problems in all domains of health. International peak bodies and Australian national guidelines recommend timely assessment of health needs following entry to out-of-home care. There are no data available that describe the timing or extent of health service use by children following their entry to out-of-home care. This protocol paper describes a retrospective state-wide cohort study identifying health services use by new entrants to care over a five year period. This study will be the first to examine timing and extent of health service use by Australian children in out-of-home care using administrative datasets. This study will use both state and federal health datasets to capture health service visits across primary health services and hospital based services. Despite the challenges, routine assessment for identification of health needs continues to be recommended by peak bodies and policy-makers in the USA, the UK and New Zealand.18–20 34 It was recommended in Australia in 201135 although no data are available to assess progress. Within Australia, state governments are responsible for child protection services and some health services (including hospitals and community health services). Approaches to the provision of health services to children in OOHC vary. In Victoria, there is no state-wide service providing routine assessment nor any means of determining the needs and access to health service for these highly vulnerable children. Data linkage provides the only option for understanding recent practice and to evaluate the impact of previous policy and programme interventions. This study aims to describe the extent and timeliness of health service use by Victorian children (aged 0–12 years) who entered OOHC for the first time between 1 April 2010 and 31 December 2015, in the first 12 months of care. What proportion of children in the cohort attended health services within the recommended time frame? What was the median time to health assessment (for initial general practitioner (GP) visit, initial paediatrician visit, dentist, audiology, optometry visits)? Was timeliness of attendance affected by the introduction of the National Clinical Assessment Framework or the Pathway to Good Health programme? What was the health service use of Victorian children aged 0–12 years who entered OOHC for the first time, staying at least 3 months, within the first year of care? Which factors are associated with improved timeliness of health visits and extent of health service use? Retrospective cohort data linkage study. The sample will be identified in the government-held Victorian Child Protection Client Relationship Information System (CRIS). It will include all children aged 0–12 years inclusive, who were placed in an OOHC placement in the state of Victoria, Australia, for the first time between 1 April 2010 and 31 December 2015, and who remained in OOHC for at least 3 months. The expected size of the cohort is difficult to determine given the lack of available data on length of placement in OOHC for first-time entrants. However, extrapolating available statistics (number of children entering OOHC and proportion in care for a duration of between 1 month and 1 year), we estimate the cohort might include around 2000 children. Table 1 provides details of the seven state and one federal database from which data will be extracted and linked. Child and placement variables will be obtained from the Child Protection database. Information about healthcare visits will be extracted from health databases. 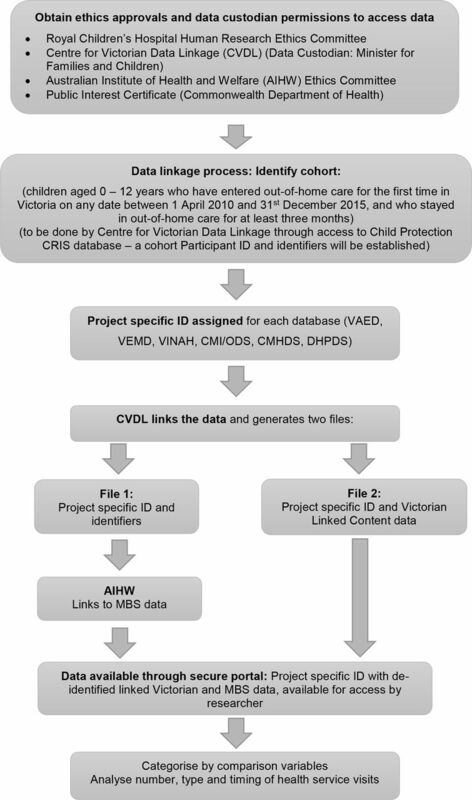 CRIS is the Victorian database to record and manage information about children within the Child Protection system. CRIS captures all Victorian children placed in OOHC. The six Victorian health databases are administrative databases that collate data reported from health services visits and admissions. Medicare is a federally funded healthcare scheme that subsidises or fully funds visits to doctors, specialists, optometrists, dentists and some allied health practitioners. All Australians are eligible. The Medicare Benefits Schedule Claims Dataset contains information on visits for which a Medicare billing claim has been processed, including the date and type of health service accessed. The Centre for Victorian Data Linkage (CVDL) will identify the study cohort within the CRIS database, and extract demographic and placement variables. CVDL will then identify records that link to the study population in the six state-based datasets. The Australian Institute of Health and Welfare (AIHW) Data Integration Services Centre (DISC) will conduct the linkage to the Medicare Benefits Schedule (MBS) dataset, using the project-specific ID and identifiers. Figure 1 outlines the data linkage processes. Data linkage process. CHMDS, Community Health Minimum Dataset; CMI/ODS, Client Management Interface/Operational Dataset; CRIS, Client Relationship Information System; DHPDS, Dental Health Program Dataset; MBS, Medicare Benefits Schedule; VAED, Victorian Admitted Episodes Dataset; VEMD, Victorian Emergency Minimum Dataset; VINAH, Victorian Integrated Non-admitted Health dataset. CVDL uses deterministic linkage, applying a series of business rules to ‘determine’ whether two (or more) records belong to the same person. CVDL also uses some ‘fuzzy matching’ to pick up slight variations in identifiers (eg, names recorded as Robert and Bob). CVDL undertakes both data linkage and integration and applies the separation principle within the CVDL team itself, using separate teams to (1) work with identifying data to link records belonging to the same individuals across multiple datasets and generate a linkage key and (2) integrate the de-identified content (service history) data. AIHW uses probabilistic linkage and applies the separation principle by also using separate teams within DISC to perform linkage and integration. The researcher undertaking data analysis will then only access de-identified and appropriately confidentialised integrated datasets through a secure research access environment. The National Clinical Assessment Framework for Children and Young People in Out-of-Home Care (December 2011). This programme was designed to implement the National Standards in parts of Victoria. General practices were recruited to provide a medical home and timely initial health checks. Multidisciplinary clinics were established at the Royal Children’s Hospital and two community health centres to perform comprehensive assessments approximately 3 months following entry to OOHC. Each clinic has a paediatrician, psychologist and speech pathologist who assess the child and provide a Health Management Plan. Vision and dental assessments are also recommended for all children. All local first-time entrants to OOHC after November 2012 were eligible for clinic assessments, and the first children were seen May 2013. While some data are available from the PTGH clinics about the children that have been seen, nothing is known about what services the remaining children are receiving and when they are receiving them. The outcomes of interest are overall health service use in the first 12 months after entry to OOHC and timely health visits, particularly to a GP, paediatrician, dentist, audiologist and optometrist. Table 2 outlines outcome measures of health service use. Timeliness will be defined by the National Clinical Assessment Framework. The initial GP visit following entry to care will be counted as the initial health check, expected within 30 days of entering OOHC. The initial audiology, optometry and dental visits will be considered to fulfil hearing, vision and dental checks, expected within 3 months of entry to OOHC. An initial specialist physician visit or an extended GP visit that follows an initial visit will be considered to fulfil the comprehensive health check, also expected within 3 months. The timeliness of visits will be analysed by determining the proportion to meet national standards, the median time to first attendance with a provider following entry to OOHC and the proportion with no attendance within 12 months following entry to OOHC. Survival curves for time to first visits with specific provider types will be generated. To determine whether the policy or programme interventions impacted the timeliness of health service use, the cohort will be divided into subcohorts for comparison. Risk ratios and risk differences will be used to compare the probability of meeting the national standards both before and after the interventions and between areas that had access to the PTGH programme and those that did not. Descriptive statistics will be used to report on the extent of health service use for each child over the initial 12-month period of care: number of visits to each health service (mean, median and range, for the entire cohort, and for those who attended each service). As some of the cohort will exit OOHC before 12 months, analysis and interpretation will depend on the pattern and proportion of children exiting the cohort and adjusted accordingly. The cohort will be analysed by child and care system explanatory variables (see table 3) to identify those which are potentially significant. Such variables will be included in a multivariable logistic regression model to examine the effects on the odds of timely health visits and in a proportional-hazards regression model to examine the effects on the time to first health visit for different services. Neither patients nor the public have been involved in the study design. To guide interpretation of findings and use in service planning, the project steering group includes policy stakeholders from relevant government departments, health and child welfare sectors and community service organisations including an Aboriginal Controlled Community Organisation. Findings will be disseminated through the Outcomes Practice Evidence Network of the Centre for Excellence in Child and Family Welfare, scientific papers and presentations at conferences. The accuracy of identifiers will determine the quality of data linkage. Some health visits may not be detected if some of these identifiers were not consistent across services. Potentially, some early visits may not have been billed to Medicare if the child’s Medicare number was unknown. These limitations would underestimate the timeliness and extent of health service use. The quality of each dataset will need to be determined; some state-based datasets may not capture all relevant health visit types and may underestimate health service use. We will analyse the cohort by Aboriginal and Torres Strait Islander status. This will be determined within CRIS. Aboriginal children may be underidentified in this cohort. While there is now policy and practice emphasis on identifying Aboriginal children to ensure they receive culturally appropriate care, this may have been less in 2010. Additionally, Aboriginal children may receive their healthcare at Aboriginal Controlled Community Health Organisations (ACCHOs). While Medicare MBS billing is used by ACCHOs for medical and some other services, services do not routinely report other visits into the study datasets which may underdetect some health service use. This could limit the interpretation of results for some types of health services for Aboriginal children. While all children entering OOHC ought to have health needs assessed and addressed, this study will include only those entering for the first time and remaining in OOHC for at least 3 months. Some children have briefer stays, never to re-enter, and some children have multiple episodes of care of variable duration. The focus in this study is those who stayed long enough to have health needs assessed as per the national standards. The 12-month time frame following entry to OOHC was deemed adequate for health needs to be identified (even after 3 months) with some follow-up. Prior to accessing the data, the pattern of exit within the 3-month to 12-month time frame is unknown. It will not be possible to directly analyse whether the extent of health service use is in proportion to actual morbidity load. Such interpretation will rely on local and international morbidity data from audits of smaller OOHC cohorts. We will also be unable to determine the impact of assessment on health outcomes. Children entering OOHC are highly vulnerable, with high rates of physical, developmental and mental health problems. Assessment of health needs ought to be routine and timely to enable early detection and management for optimal outcomes. While Victorian policy supports such practice, little is known about the extent and timeliness of health service use for this cohort. This study will provide the first such state-wide report, over a 5-year time frame, using both state and federal health datasets to provide a comprehensive study of health service use. We expect to be able to identify which child or care system variables, if any, are associated with timely health assessment. The study will also explore the impact (if any) of the national standards and the Pathway to Good Health Programme.
. Untreated dental caries is common among 6 to 12-year-old physically abused/neglected children in Spain. Eur J Public Health 2003;13:91–2.
. The mental health and wellbeing of children and adolescents in home-based foster care. Med J Aust 2007;186:181–4. Royal Australasian College of Physicians. Health of children in "out-of-home" care. Sydney: RACP, 2006. Department for Education and Department of Health. Promoting the health and well-being of looked-after children: statutory guidance for local authorities, clinical commissioning groups and NHS England. England, 2015.
. Mental health service utilization by children in foster care in California. Pediatrics 1992;89:1238–44.
. Children in foster care in California: an examination of Medicaid reimbursed health services utilization. Pediatrics 1992;89:1230–7.
. Children in foster care in the state of Washington. Health care utilization and expenditures. JAMA 1994;271:1850–5.
. Health service utilization of children in delaware foster care, 2013–2014. Del Med J 2016;88:46–52.
. Promoting health of looked after children. Monitoring and documentation should be improved. BMJ 2000;321:381.
. Children in out-of-home care in NSW: what do their case files tell us about their health care? Developing Practice 2012;30:53–62.
. Improving healthcare for children entering foster care. Child Welfare 2007;86:123–44. Ministry of Social Development. Gateway assessment service: service specification. New Zealand, 2015. Department of Families, Housing, Community Services and Indigenous Affairs together with the National Framework Implementation Working Group. An outline of National Standards for Out‐of‐home Care. Canberra, 2011. Child Health and Wellbeing Subcommittee Australian Population Health Development Principal Committee. National Clinical Assessment Framework for Children and Young People in Out-of-Home Care (OOHC). Canberra, 2011. Contributors KM led the writing of this paper. All authors contributed to the design of the study and the writing of this paper, and approved the final draft. Funding This research is supported by a Learning System Grant from the Centre for Excellence in Child and Family Welfare, the Child Health and Wellbeing Unit, Department of Health and Human Services, Victoria and the Victorian Government’s Operational Infrastructure Support Program. KM is supported by an Australian Government Research Training Program Scholarship PhD scholarship and Murdoch Children’s Research Institute scholarship. SG is supported by Australian National Health and Medical Research Council (NHMRC) Career Development Fellowship 1082922. HH is supported by Australian National Health and Medical Research Council (NHMRC) Career Development Fellowship 1136222. Ethics approval Ethics approval has been granted by the Royal Children’s Hospital Melbourne Human Research Ethics Committee (HREC no. 37208A, 24 October 2017) and the Australian Institute of Health and Welfare Ethics Committee (EO2017/5/405, 5 December 2017). Approval has been granted by the Data Custodian in Victoria and a public interest certificate signed for the MBS billing data.